Coral reefs are located in shallow, warm, and salty waters. They are home to a great variety of fish and several other types of marine life. A coral reef if a structure made of coral that keeps attaching to coral to expand the reef, to survive, and to provide more homes to the exuberant amount of aquatic life that thrives there. However, coral reefs are at high risk. 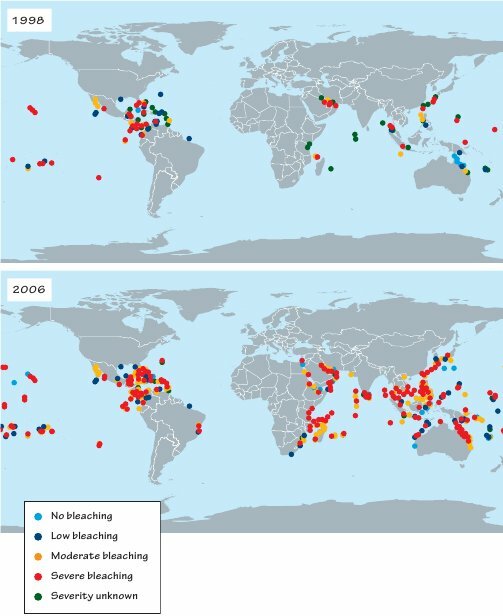 They are being bleached, or coral being turned white and becoming low in nutrients and the marine life that once thrived there.The bleaching risk is reaching higher levels each year and is spreading to coral reefs all arounf the world. The coral bleaching has been associated with climate changes and global warming. We should be taking many precautions to help conserve the beauty of these magnificient wonders of the marine world. They are home for many fish and plants that we use for food and so many other things. A coral reef may also be home to an undiscovered cure for a deathly disease such as cancer. If all the coral reefs in the world go away, then we would have lost a natural wonder that is so spectacular to experience. Think before dumping trash or unnatural liquids into this widely diverse community. Do your part to conserve coral reefs for a beautiful tomorrow.